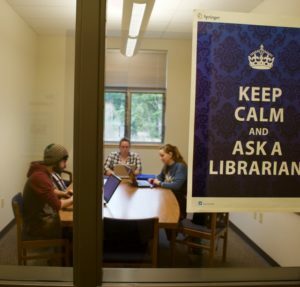 The Oregon Coast Community College Library is committed to providing a safe, pleasant, and productive environment for research and study. Failure to comply with the Library’s Study Room Use Policies may result in being asked by library staff to leave the room and/or the Library. Disputes regarding room use and occupancy or refusal to follow library staff directives regarding these policies may be temporarily blocked or permanently banned from using the study rooms. During the Term: Study Rooms will be unlocked at 9am and locked at 6p, M-Th, and 9a-5p on Fridays. Between Terms: Study Rooms are reserved for students with tutors. Please check in at the Library Services window to have the room unlocked, M-F, 9a-5p. Study Rooms can be used for a maximum of three hours at a time. Students may come out to the Library Services window to extend the time if no one is waiting to use the room. Reservations are limited to one per day; multiple individuals in a group are not permitted to make multiple reservations in a day. Exceptions may be made if there are no students waiting. Individual Study Room’s maximum capacity is two adults. Study Rooms with computers (individual), must abide by the library computer policy. Three or more people constitute a group for purposes of using a Group Study Room. If fewer than three individuals are present in a group study room, they may be asked to move to a smaller room. An individual cannot hold a group room while waiting for the arrival of others for more than 15 minutes. Food and open containers are prohibited. All trash items must be placed in the trash cans before exiting. Smoking, sleeping, cooking, gaming, partying, painting, playing music, and/or any other activities disruptive to others are prohibited. Occupants are prohibited from using equipment that may cause a safety hazard. Furniture cannot be moved in or out of a room. Neither the Library nor the College is responsible for unattended, lost, stolen or damaged personal items. Unattended personal property cannot be used to hold a room by any individual or group. Study Room privacy is not guaranteed. Library staff members reserve the right to enter any study room at any time without prior permission of the occupants. Any obstruction of the windows is prohibited. Windows must be closed when exiting. The Library requires users to sign in at the Library Services window for the purposes of collecting statistics on study room usage. Users are not required to leave their entire name, or even their real name if they choose not to. Any and all user names are redacted each evening prior to close of business. Only library staff have access to the logs, and they are retained until statistics can be pulled from them.